Adult learning theory suggests that adults need to perceive the relevance and purpose of learning in order to learn most effectively. Grounded in the notion that adults frame their own learning objectives, are self-directed and active participants in their learning, require constructive feedback and want opportunities to practice new skills, online and virtual learning environments are well suited for adult learners and are directly based on adult learning principles. Virtual environments provide opportunities for adults to construct learning based on what they already know and apply what they are learning in the instructional setting. An online instructor is an adult learning expert. Using adult and constructivist learning theories and current knowledge about web-based andragogy, this chapter will focus on the characteristics and learning preferences of adult-learners in virtual learning environments and recommend instructional design and teaching strategies to encourage behaviors that influence student engagement, retention and learning. Adult learning and constructivist learning theories, as applied to web-based learning, provide the framework for benchmarking best practices in online learning (Burge, 1988; Diaz and Bontenbal, 2001; Grant & Thornton, 2007). Moore and Kearsley (1996) wrote that the more one understands andragogy and the assumptions of adult learning, the better one will understand the nature of distance learning and hence, the advantage of learning technologies. Consequently, various adult learning theories and philosophies have influenced the development of best practices on virtual teaching: Knowles’ (1980) assumptions of adult learners, Dewey’s (1938) thoughts on experience and education, Candy’s (1989; 1991) work on constructivist thought and self-directed learning, Jarvis’ (l987) social context in adult learning, Friere’s (1986) “cycle of action and reflection”, described as “praxis”, and Roger’s (1967) acceptance and respect for the learner. These theories are integral to the development of effective virtual learning environment for adults. New knowledge about generational learning styles is expanding what we know about adult and generative learning, bringing necessary and added dimensions to virtual teaching and learning environments. As online course designers and developers recognize the application of these and other theories, they can construct learning objects and virtual environments that are comprehensive and specific to adult learning. The line between teaching and facilitating is blurred when the student becomes the focus of the learning space. Meeting the adult-learner where they are in their learning process is key to effective teaching and the point where learning begins. The place where facilitation and connectivity meet is the online, virtual learning community. Adult learning theories that inform best practices of online teaching, course design, delivery and management expand the connectivity and interconnectivity of virtual learning environments. This chapter will describe adult learning theories and their implications for distance learning. Principles of adult learning will be examined for application in design, delivery and management of web-based instruction. The focus will be on learning how to create relevant and meaningful learning environments to engage and retain online adult learners. 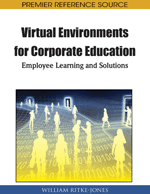 Recommendations for adaptability in different virtual learning environments are proposed. The first section provides a theoretical background of adult learning to describe web-based andragogy. The second section reviews current research on adult online learning and summarizes characteristics of online adult learners and learning preferences. The third section describes online instructional processes which cut across generational lines. The final section discusses the implications for practice and future development of instruction in alternate virtual environments. This chapter provides insights into teaching adults online that can be used by corporate trainers and facilitators to plan and implement successful virtual training and development programs which satisfy and address the needs of a multigenerational and diverse workforce.